Enjoy a wonderful evening when, for the first time ever, a Kazakh orchestra performs in Ireland to celebrate 25 years of diplomatic relations between the two countries. 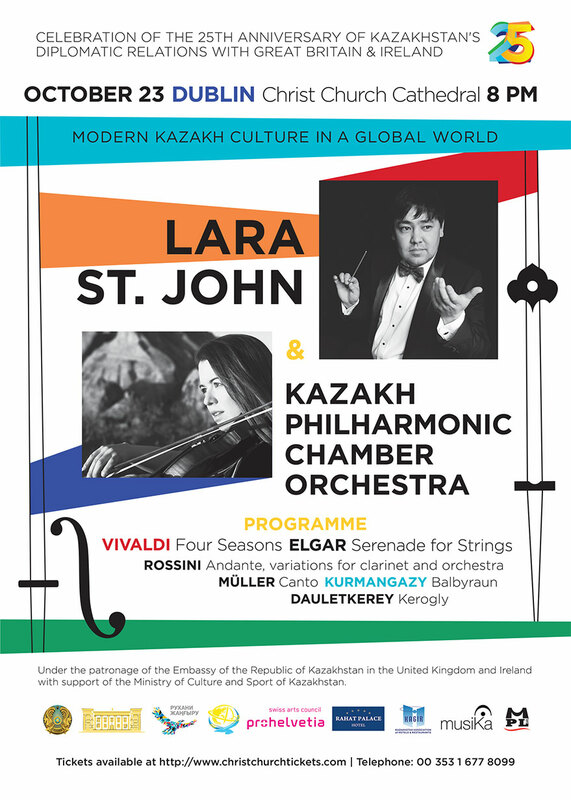 The concert will be the first on a tour which will see the orchestra perform in Dublin, London and Manchester; the visit launches a new project, Modern Kazakh Culture in a Global World. The Kazakh Philharmonic Chamber Orchestra is one of the best established ensembles of Kazakhstan. Joined by famous Canadian violinist Lara St. John and multi-award winning Kazakh clarinettist Berturgan Jolaman, the Orchestra will perform an exciting programme which includes two short works by 19 century Kazakh traditional/folk composers. This is the first time for either of these works to be performed here. Also on the programme is the ever popular ‘Four Seasons’ by Vivaldi. The violin soloist in the Four Seasons, Lara St. John, has been described as “something of a phenomenon” by The Strad and a “high-powered soloist” by the New York Times. Duration: 2 hours including the interval.